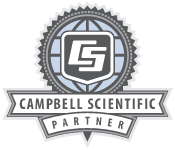 The RESPEC instrumentation team uses Campbell Scientific equipment across a wide range of monitoring and control applications. We’ve installed weather stations on volcanoes, monitoring systems in caves, creep-closure detection in mines, custom extensometers and early-warning alarm systems near sinkholes, strain gages on steep granite faces, and tiltmeters in swamps where airboats provide the only access. We designed heater-control systems for long-term waste-disposal and high-temperature rock-melt experiments. If there isn’t a system available, we’ll create one.